How can we be relevant as a church and reach our city in today’s society? The Half-Time Church: the church is only for Christians. It’s a place where Christians congregate and huddle up together, hold hands, listen to pep talk and talk their own language … just like athletes at half-time. The Seeker-Sensitive Church: the church is for the unchurched, the unsaved, the not-yet Christians. If you live this kind of church philosophy, everything you do as a church is catered towards the unchurched people: teaching and preaching is safe, worship and prayer is safe and palatable, everything is on the clock, no demons are mentioned or cast out…, speaking in tongues is limited or non-existent during church services, there is no prophesying or anything that could seem a little too spiritual to an unchurched person. Now while both philosophies aren’t wrong, they do represent two extremes that focus on only one people group, the churched or the unchurched. However, we believe, it should be a combination of both approaches. What if people looked at us and saw a bit of both? The way we address our church congregation should be reflected in the way we preach. We need to use what is relevant in our neighbourhood and community. An example is found in Acts 17:22, when Paul uses what he found in the community of Athens to preach the Gospel. Paul said he was happy to change himself and to become “all things to all people” so that he can relate Jesus to them in a relevant way that they can understand. When people come to our church, we want them to see that God is among us and that they want to be a part of this. We don’t want to be a church that is limited in the way we express ourselves and preaches the Gospel in a way that noone can relate to, nor do we want to be too liberal in the preaching of the Gospel so that the message of Christ is watered down and loses its truth and power. We strive toward being a church that is liberal in the way we do things while preaching the Gospel “conservatively”. This means that the way we preach is not necessarily conservative and outdated, but that the message remains “conservative”, undiluted and biblical. We need to contend for our faith. We may change the way we bring the message across, but the message of Jesus Christ stays the same. There are closed hand issues and open hand issues: We hold on to our core values. Methods can change. 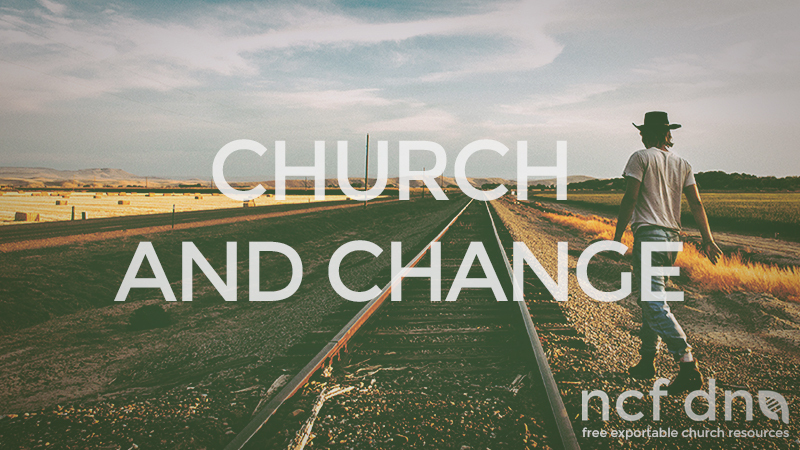 When change is about to happen, we need to remind the congregation about what is not going to change. We can never become loose in our theology. Mission focussed. Jesus left us here on earth with a mission to go and preach the Gospel. People embrace change when they see it part of God’s plan. Events. Events are not only amazing outreach tools, but they also help the church. For example, an event may help modernise the church facility and that will benefit the church as whole. Slowly, do not draw attention. Some things we want to change don’t require permission from the entire congregation. These things we can change slowly without drawing attention to the change. Enthusiasm. When we want to invoke change, we need to be excited and enthusiastic about the change. We need to get our team on board with us and get them excited about it. The reason why we change is so that we can become all things to all people and preach the Gospel of Christ. –staff notes by Grant Crawford compiled by Sabby Mahabeer.